Belfast Giants beat Glasgow Clan 4-1 in their Elite League clash thanks to goals from Darcy Murphy, Colin Shields, Blair Riley and David Rutherford. After knocking the Scottish side out of the Challenge Cup on Thursday the Giants maintained their title charge with another important two points. The hosts led 3-0 at the SSE Arena and Jack Musil pulled one back before Rutherford sealed the two points. 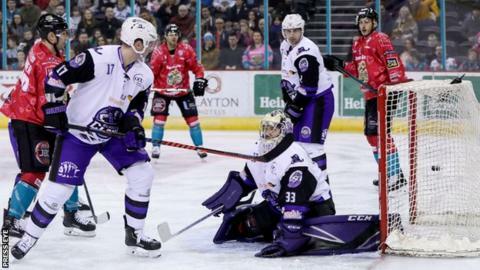 Belfast remain a point behind leaders Cardiff Devils. Cardiff were pushed all the way by MK Lightning on Saturday night but came through 6-5 winners. The Giants struck after only 44 seconds on the first powerplay of the game with a really well worked goal. Pat Dwyer sent the puck down low to Kyle Baun and his superb backhand pass found Murphy for the backdoor finish. Belfast doubled their advantage at 12:43 when Murphy's shot wasn't held by Clan netminder Joel Rumpel, which allowed Dustin Johner to nip in and set up Shields to slide the puck across the line. The sides traded goals in the second period with Riley finishing an odd-man rush up ice with a wrist shot that beat Rumpel before the visitors got on the board through Musil. The Clan put the Giants under a lot of pressure as they chased the game in the final 20 minutes but the home side held out and Rutherford made it four by finishing off a three-man move with Chris Higgins and Jordan Smotherman grabbing the assists. The teams will meet again on Sunday in Glasgow (16:00 GMT face-off).